A cogent, accessible discussion of “institutions” and “new institutionalism” from political science. These have been key concepts in my intellectual development and work. The study of public policy would be incomplete without an understanding of policymaking institutions. The study of political science would also be incomplete without turning our understanding of terms such as ‘institutions’ upside down. ‘Institution’ may in the past have referred to organizations such as legislatures, courts and executives. 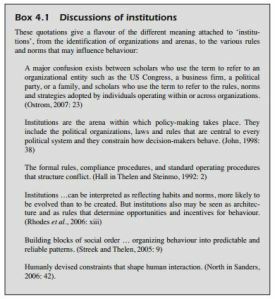 With ‘new institutionalism’, it refers to two factors: regular patterns of behaviour; and the rules, norms, practices and relationships that influence such behaviour. The constitutional nature of political systems – such as confederal or federal; federal or unitary; presidential, parliamentary or semi-presidential; unicameral or bicameral; containing constitutional courts; or holding procedures for regular referendums.